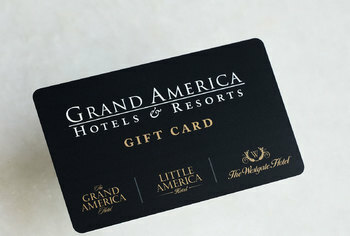 There is a Little America gift card to please everyone. Gift cards are available in dollar amounts only. Cards are redeemable for guest rooms, retail shops, Coffee Shop, Lucky H Bar & Grille, Lobby Lounge, or In-Room Dining. To order a gift card, simply enter the amount of the gift card and click Order Now. Limit message to 150 characters.